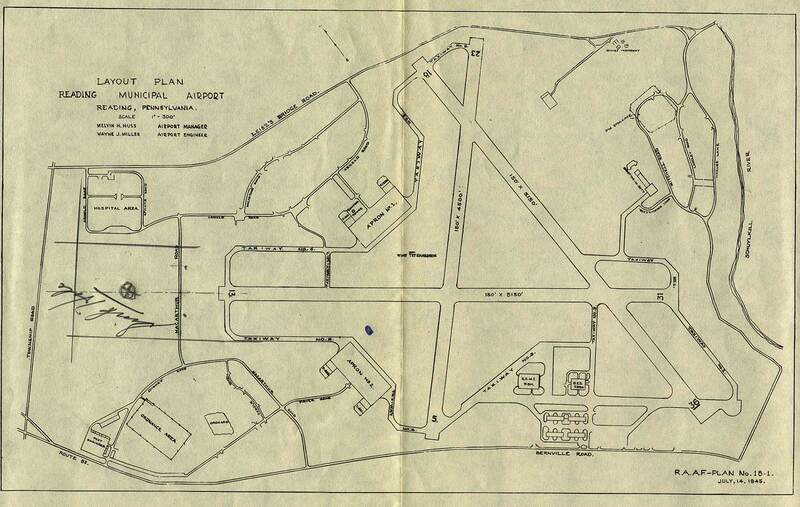 As early as 1934 the site for the Reading Municipal Airport was selected. The land in Bern Township was acquired by purchases made by the City and County at a cost of $40,682. Work was started on the 180-acre tract in August 1936 as a WPC project, toward which the government contributed approximately $1,000,000 and the City $500,000. The fireproof hangar was erected through a CWA project at a cost of $75,000 and the restaurant for $18,000. The field was dedicated during a two-day ceremony in October 1939 which attracted 103,000 spectators. The event brought to Reading some of the nation’s leading aviation officials, military pilots, acrobatic fliers and planes from three of the country’s biggest airlines TWA, American and United. It was on August 1, 1941 that TWA started regular daily service into the City, connecting Reading with leading cities on the East-West route from coast to coast. This was the first step toward that day when our city would have complete airline service to all points not only in this country, but in foreign lands. In 1942 the government took an interest in the field and developed a project which is 1943 became the Reading Army Air Base covering more than 800 acres. 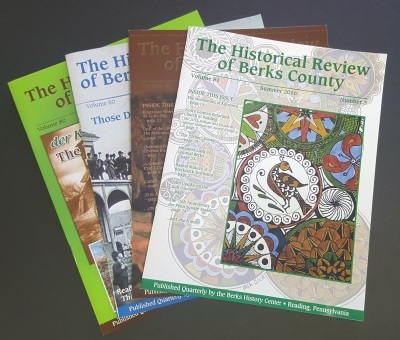 The City’s obligation was to purchase land at a cost of $150,000 toward which the County of Berks made a substantial contribution. The War Department spent more than $10,000,000 in erecting buildings of every description and extending runways to such lengths to accommodate the nation’s largest aircraft. The construction consisted of excavating 1,300,000 cubic yards of earth and rock on the site, the excavating and hauling of 2,000,000 cubic yards of shale from a borrow pit located approximately 2 miles from the airport. Two runways each 3150′ x 150′ and one runway 4500′ x 150′ were constructed with 10″ slag base and 2″ asphaltic concrete surface with the exception of the ends which are concrete. The taxiways connecting the runways and aprons consist of 17,500 linear feet x 50′ wide bituminous paving under the same specifications, which totaled 342,088 square yards There were 9 1/2 miles of bituminous roadways constructed totaling 109,625 square yards. Parking areas and walkways totaled 21,000 square yards The concrete aprons and turnarounds at the ends of the runways total 108,400 square yards There were 276 various type buildings and structures constructed which included 5- hangars, machine shop, warehouses, operational buildings, barracks and miscellaneous buildings. There were 102,500 linear feet of storm sewers constructed varying in site from 12″ to 48″ in diameter carrying the drainage from 930 manholes and inlets on the airfield, to the Schuylkill River. The sanitary sewer system consists of 6 1/2 miles of 8″ to 12″ pipe flowing by gravity to the 150,000 gallon per day Sewage Treatment Plant which was also constructed as a part of the general plant. The electrical distribution system consists of 9 miles of overhead and underground lines phase with 2,400 and 4,800 volts. The water distribution system consists of 10 miles of mains and services ranging from 1″ services to 12″ mains carrying water directly supplied by the City of Reading. In May 1943 the Army Air Force occupied the base with operations and tactical units and sub-depot area. In January 1944 the Air Service Command took over complete operation of the field to service America’s war planes returning from the world’s tar-flung battle fronts. In February 1946 Transworld Airlines International Division set up a school in the main hangar, for training overseas flight crews. Four engine Constellations were flying night and day during this training period. On March 1, 1946 the City of Reading took over the operation and management of the airport from the Army Air Forces. On May 15. 1946 Colonial Airlines inaugurated service to Reading, between Washington D.C. and Ottawa-Montreal. In December 1946 the Army Air Force Reserves and Pennsylvania National Guards occupied the North area of the Airport and set up training units with approximately 75 various type planes. Municipal Interests at the field are supervised by the Reading Airport Authority of five members who have enjoyed full support of several city administrations. The airport is 3.1 miles from the center of the city, being located along the concrete Bernville Pike Route 183. To date eleven airlines have made application with the Civil Aeronautics Board to stop in Reading in the postwar era including such big companies as Eastern, United, American and Pennsylvania-Central. Such service as carrying summer vacationists to seashore resorts and winter vacationists to Florida playlands has also been proposed for Reading. The Reading Municipal Airport serves a metropolitan area of upward of 300,000 people, which includes hundreds of industries and our agricultural territory.